The Family Picnic has continued to be an annual favorite as well as our monthly Family Breakfast, special dance nights and our Society meetings. On a weekly basis the Friday night buffet, membership drawings, bowling leagues continue to entice our members. Not to be forgotten is the daily schedule when the clubroom offers our members and guests a place to meet and enjoy food and libation of choice where you are never ashamed to bring your child, sweetheart or grandmother. 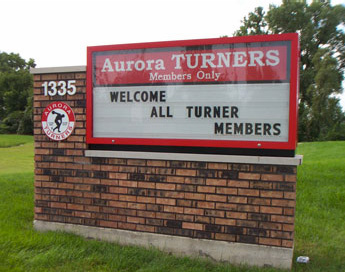 This is what Aurora Turners has offered its members for more than 150 consecutive years; through 8 wars, financial hardship, 6 different locations, good times and some not so well; all a vital part of the legacy of what makes Aurora Turners a special second home to each individual and family with the privilege of a membership. Check out our new Rental Prices & Catering Menu! Any denomination! See Bartender for purchase. Saturday, April 20th from 2pm - 4:30pm - Lower Level of the Club. Don't miss our annual Children's East Egg Hunt & Party! Open to our Members' Children 11 and younger. We're planning a special and memorable day for families with food and activities for all! Don't forget to bring your cameras! Download a flyer here. Saturday, April 20th from Noon - 4pm in the Club. Hip Hop on down the bunndy trail and join us in some fun & shopping! We have over 20 Crafters to choose from. Hop on over on the 20th! Download a flyer here. Saturday, June 22nd at Phillips Park Golf Course. Arrival Time at Noon, Shotgun Start at 1:30pm - 4 person scramble team. Hurry and Sign up by June 1st! For more information, download a flyer here or downlod a registration form here.